The Civil Service Employees Association (CSEA) is committed to providing job protection and membership services for over 265,000 public employees throughout New York State. Pearl Carroll & Associates LLC has been exclusively endorsed to assist in this commitment by providing access to a wide variety of insurance products that can help to protect the personal financial security of CSEA members. For nearly seventy years, Pearl Carroll & Associates LLC has worked with CSEA to provide members with access to affordable, high quality insurance options. The following is a brief outline of the comprehensive coverage available to you as a CSEA member. This term life insurance is available to all active CSEA members under age 70, their spouses under age 66, and their dependent children 15 days to 18 years of age. CSEA membership is required to apply and continue this insurance. Designed to meet your needs, the following benefits are available for CSEA members only. $250,000 plan maximum for members only (If your dependent spouse or child is covered for Life Basics or Premier Plan as a member under this plan, the combined amount of your life benefits and your spouse's or child's life benefits may not exceed $250,000). Dependent coverage extends members' benefits to include spouse and children (spouse coverage available from $10,000 to $150,000) child(ren) coverage of $5,000 to $10,000 is available. If your dependent spouse or child is covered for Life Basics or Premier Plan as a member under this plan, the combined amount of your life benefits may not exceed $250,000). Available to all CSEA members and spouses aged 18 through 64, and their children, ages 15 days through 24 years. This group whole life insurance may be used to supplement any life insurance you may currently have. This coverage pays a lump sum payment to offset the unexpected costs associated with surviving a critical illness. Provides insured with valuable protection and the freedom to choose the lifestyles and treatments they prefer. Insurance rates can vary greatly from one insurance company to another. In recognition of this, the CSEA Valuable Insurance Programs (VIP) has arranged a "buying service" to give CSEA members low cost options for their auto and property coverage. 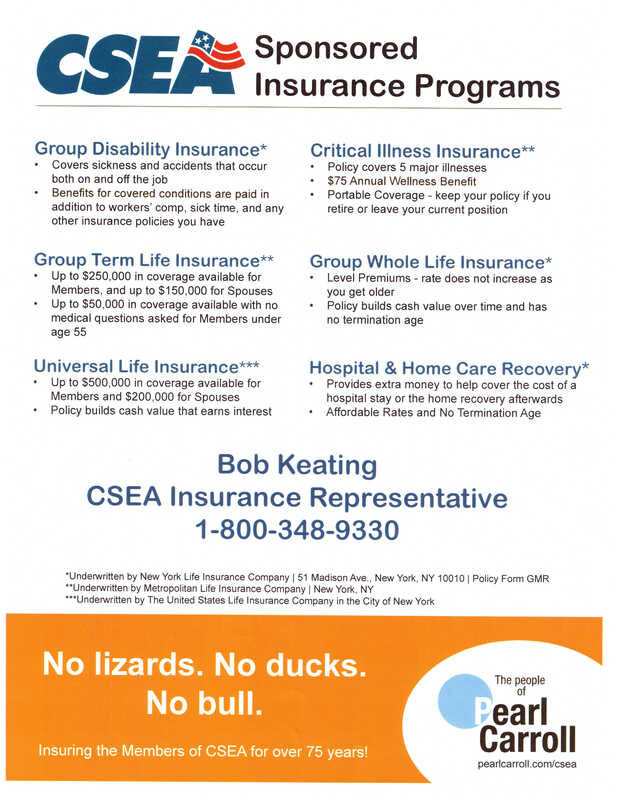 Your CSEA VIP Program has found the insurance plans that work for you! Print out the VIP Information Card and mail it in to get your insurance assistance. A wide variety of insurance products that can help to protect the personal financial security of CSEA members.